There’s none so blind as those who will not see. Only a little more than eight months ago — on June 3, 2011 — the U.S. Secret Service advised a federal judge in Maryland that HYIP schemes spread in part through coordinated posts on “discussion boards.” One of the boards referenced in a Secret Service affidavit aimed at seizing tens of millions of dollars in “criminal proceeds” linked to HYIP hucksters and other scammers was TalkGold. Yes, that TalkGold, the Ponzi cesspit, the same TalkGold to which promoters of JSS Tripler/JustBeenPaid race to fire up “I got paid” posts to help sustain a scam that advertises an annualized return of 730 percent on top of two-tier downline commissions totaling 15 percent — more, if members choose to “compound” their “earnings” by leaving them in the system. JSSTripler/JustBeenPaid promoters are doing this on the Ponzi forums even after CONSOB, the Italian securities regulator, announced a JSS Tripler-related action late last month and certain promoters’ websites in the United States suddenly have gone missing this month. Frederick Mann is the purported operator of the scheme. It was not the first time TalkGold’s name had been referenced as a place from which massive fraud schemes were promoted. The board was referenced in 2010 filings by the U.S. Postal Inspection Service in the Pathway to Prosperity (P2) case. So was MoneyMakerGroup, another Ponzi and fraud cesspit. P2P operator Nicholas Smirnow was charged criminally, and investigators described P2P as an HYIP scheme that had spread to at least 120 countries and created as many as 40,000 victims. The alleged P2P haul: about $70 million. Courtroom references by the Secret Service to TalkGold in the context of fraud schemes date back at least to 2007. Based on the Secret Service affidavit and voluminous evidence culled in the aftermath of the 2007 E-Gold investigation that had led to 2008 guilty pleas on charges related to unlicensed money-transmitting and money-laundering, the judge authorized the seizure of tens of millions of dollars from the E-Gold accounts of alleged scammers who’d set up shop through E-Gold to fleece the masses. E-Gold is assisting investigators in ridding itself of corrupt proceeds warehoused as a result of the money-laundering allegations in 2007. It has cooperated with prosecutors in identifying accounts linked to HYIP scammers and other hucksters. The Secret Service agent who filed the affidavit is the same agent who led the 2008 AdSurfDaily Ponzi scheme investigation, which resulted in the forfeiture of at least $80 million and criminal charges against ASD operator Andy Bowdoin. Even though the agent allegedly has been targeted with false liens by so-called “sovereign citizens” for his work in the ASD Ponzi case, he continues to serve in a capacity that is vital to the security of the United States. He has conducted numerous investigations involving money-laundering and other crimes. These cases, according to court filings, have resulted in the seizure of more than $300 million in “criminally derived proceeds.” That is more than a quarter of a billion dollars. The agent and his colleagues have worked with a Task Force whose members reverse-engineer fantastically complex financial crimes. The court-appointed administrator handing the claims process is the same company that handled a similar process in the ASD Ponzi case. E-Gold has done the right thing in cooperating with investigators. Any person who spends so little as five minutes on the Ponzi boards knows that Canada-based AlertPay is conducting business with serial promoters of outrageous frauds — frauds that have grave consequences to individual pocketbooks and frauds that have grave ramifications to national and international security. And now, according to posts that originate on forums referenced in multiple U.S. court filings about massive international fraud schemes, AlertPay is sending debit cards to the scammers. “Thanks Mann & Co.,” the excited poster announcing her coup on MoneyMakerGroup said, adding five smilies to accent her glee after her earlier reference to ATMs and stores that now could be used to offload profits from a scheme that advertises a return of 2 percent a day. 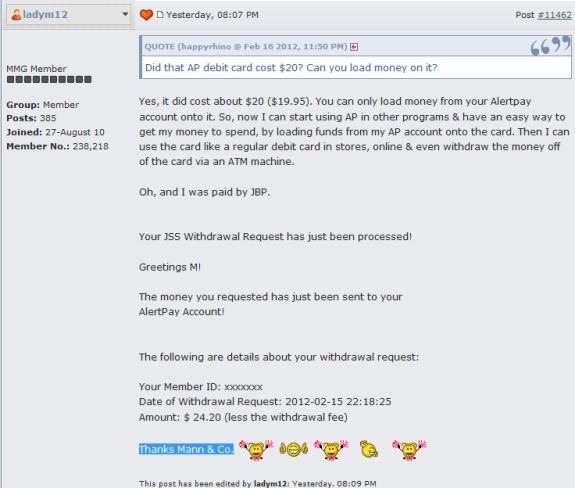 In an earlier post, the MoneyMakerGroup member said she received the AlertPay debit card in her mailbox in North Carolina. “Now I’m able 2 get my money out FAST!!!!!!!!!!! !” she roared. MoneyMakerGroup post from Feb. 16 by promoter of JSSTripler/JustBeenPaid. The post highlights the utilty of AlertPay debit cards in joining other "programs" and offloading profits at ATMs and retail outlets. From Paragraph 55 of a U.S. Secret Service affidavit filed in U.S. District Court in Maryland on June 3, 2011.